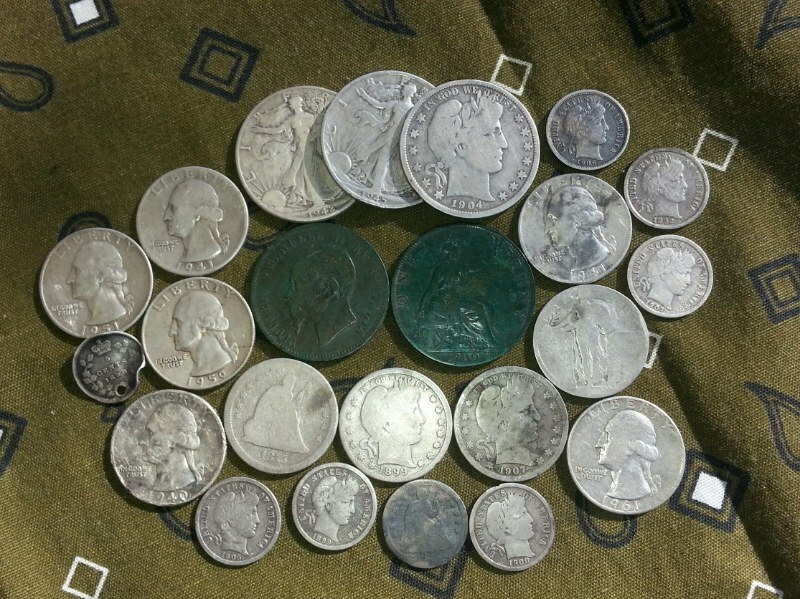 A good weekend, a silver weekend..
A cold weekend with stiff winds couldn’t keep me from seeking silver. Finally a silver coin with the etrac, a 1946D Roosevelt. I had to use “two tone ferrous” to find it in the thick iron. It was about 6″ deep in an area surrounded by nails, in fact ALL my targets were surrounded by nails. I also found 2 wheats 1917, 1953D and modern quarters and dimes. Two tone ferrous seems to work much better in areas we hunt. Standard mode iron falses way to much on deeper older iron targets. I’ve dug at least thirty holes where the TID is at least 50/50 good numbers verses iron numbers and its been 100% trash. Deep on/off – makes deeper sounds as strong as shallow sounds. The thought is it would help identify deeper target by sound. Recovery fast – increases response time to differentiate targets close together. Downside, it changes the sound (distorts it?) response of of the target making it harder to ID a target by sound. I started out using deep off and recovery fast when I first received the etrac and decided to try changing to deep on and recovery fast off (recommended by many for finding deeper coins) . I tried it for three days at one 1800’s era house, 1940’s bungalow lot (building torn down) and two old schools. I noticed being able to identify deeper iron falsing from another target was almost if not impossible for me. Between the iron falsing sound and then the nulling of the iron it created a distorted picture of what was in the ground. I tried using Quick mask to help sort out the target but the numbers were so random it was impossible to tell. I just assumed there were no coins or other conductive material below. Well, at the 1800’s era house which must be the iron capitol of the world I came across a target that put these settings in question. I came across a target that was obviously near iron. Amongst the myriad of iron falsing signals I had a quick random number at one angle that didn’t fit the normal pattern of signals. It was numbers I would associate with a possible nickel signal. Quick mask barely detected the different metal also. Two tone ferrous indicated a possible conductive target. So I dug all the targets in the hole. I found an old button a bit larger than than a M & M and two small deteriorated nails offset and below the button. I’m pretty sure if I had recovery fast on I could have singled the button out. There was a pretty good sized gap between the button and nails. I’ve found coins closer to nails than this sample. So now I question a couple targets I came upon earlier in the day. Since deep silver numbers are pretty close to iron falsing numbers I think the possible signals are blended without recovery fast. Having fast on, regardless of sound difference gives you a little better information in the TID numbers than relying on just the sound. I’ve yet been able to determine the “sound” difference between deep iron falsing and a deep coin. The TID numbers have helped me to decide to dig. I can rationalize using these settings in an area with less trash and iron though. Two tone ferrous (TTF) – this is work in progress. I can see how this can work. I just find it almost impossible to sort out iron falsing from a good conductive target as of yet. Last five days finds: 1 – Quarter, 2 Nickels, 2 Wheats (1944D, 1945D) and 7 Memorials. Not bad, but I’m still waiting to find my first silver with the Etrac. I’ve been trying to test its full depth potential. I’ve read posts, blogs to ad nauseam about finding the deeper coins. Currently I’m becoming well versed in finding old nails! So I will continue until I find that first deep coin, hear its sound and see its TDI. I’ve been “mixing it up” with the settings to see if I can find the setup that works for me and works in our Missouri dirt. Here’s what I think of my Etrac so far. First, I’m digging WAY less trash than I did with the Ace 250. I’ve dug more nails, but its because I’m digging questionable 8+ ” deep targets. I’ve only dug one pull tab, a little foil and unknown metal I’ve yet to identify. No bottle caps!!!!! I’ve dug hundreds of bottle caps with the Ace 250. I’m finding more Quarters and Dimes for sure since I’m re hunting ground covered previously with the Ace 250. The one question I’m looking for the answer to, are there more older coins still in the ground, but just deeper? If so, how much? So far the answer has been, no. I’ll try to see if the answer changes over the course of this year. Well I finally made the plunge for an Etrac. I’m so ready to go out and see what kind of coins I’ve missed with the Ace 250. Don’t get me wrong, the Ace 250 is an awesome machine and by upgrading the coil for a $130 I out competed machines twice the cost of mine. I just had to dig twice as much junk as the others to out compete them. I’ve had the Etrac for almost a week and only been able to get out with it 3 or 4 times since the temp has been in the 20’s with gusty winds. I went out briefly the first three times just to get used to hearing the different sounds and play with the settings. Let me tell you, the first few hours I was overwhelmed by the sounds. I read a posting on another blog where it was described like R2D2 having a fit. I must agree… I was able to go out yesterday and dig about 4 or 5 targets finding a clad dime at about 6″ and a clad quarter at 7″. My other digs were square headed nails which rang up like silver dimes and a brass button (lacking a better term). So I’m going to have to work on figuring out the difference between dimes and nails. The dime was in an area I couldn’t hunt with the Ace 250 due to EMI, a term I dislike as much as can slaw and bottle caps! The quarter on the other hand had been passed over by me several times, also by an AT Pro and an Omega 8000. So I’m really feeling good about the Etrac now. Since we’ve received about 4″ of snow last night and today, plus the temp is hovering around 5 degrees I’ve spent my time entering discrimination patterns. So if the weatherman isn’t speaking with a forked tongue I should be out hunting silver by the end of the week! Best of luck!